The system would utilize the 300 NM distance profile because it is the next lowest distance from the leg distance. Considering that it is using the 300 NM profile, the calculation would have the aircraft climbing all the way to 39,000 ft. Ground speed it calculated for the climb and descent based on the climb/descent speeds for the 300 NM configuration and winds for the lat/long of the top of the climb and start of descent. Ground speed is calculated at four additional points along the flight path considering winds at each lat/long. An average is calculated across all 6 ground speeds and utilized for the final flight time calculation. If Calculate with Flight Planning is enabled for an aircraft, additional options will be available for each distance profile to indicate which cruise profile to use. 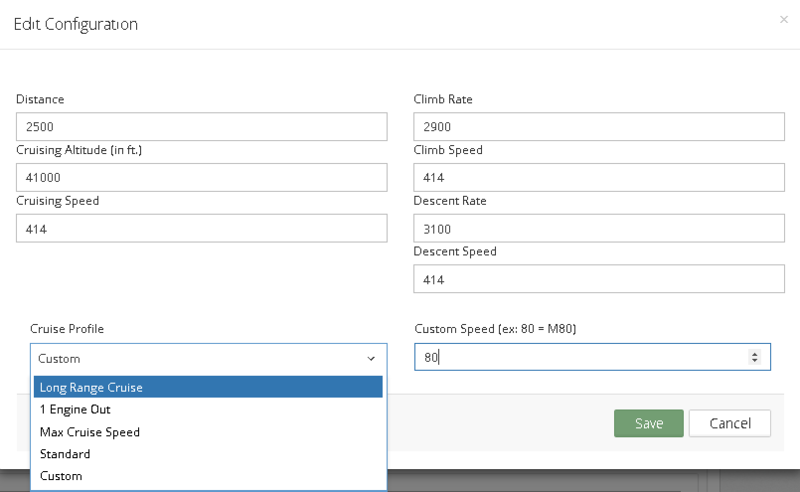 The options in the drop down will vary based on the aircraft type but common options will be Long Range Cruise, Max Cruise Speed and Standard. Long Range Cruise, for example, will optimize the fuel economy for the flight calculations while Max Cruise Speed will favor maximum performance. If Standard is selected, a fixed cruise speed will be maintained through the flight using the manufacturer recommended speeds. Finally, if Custom is selected, an additional field will be displayed which allows the user to enter a custom fixed Mach value (ex. If the desired speed is Mach 80, then 80 should be entered). If a flight leg reverts to Great Circle, it will use the Basic Avianis Flight Time Configuration values from the table. If the flight planning module is enabled and Great Circle is selected as a cruise profile, it is using the enhanced Great Circle data (Manufacture Performance data, point to point and winds). 'Calculate Winds' found in the Aircraft Profile will affect calculated flight time.